An impressive documentary sheds light upon a fascinating subject and presents it to viewers as objectively as possible. However, the subject a film like Jesus Camp, which tackles a Pentecostal kids' camp, practically ensures the film falls into the realm of controversial documentaries. If anything, the filmmakers likely worked overtime to portray the film's central camp to not look exactly like any other disturbing cult. To this day, Jesus Camp is considered one of the most controversial documentaries ever made. On the one hand, some American Christians believed their religion was being portrayed unfavorably, while other Christians and Americans believed what went on in the camp to be outright child abuse. Did these kids really understand what was going on? Did they know what it meant to dress in camouflage and become soldiers in the "army of God" to fight in the American culture war? Do any adults understand what that even means? Jesus Camp wanted to find out. 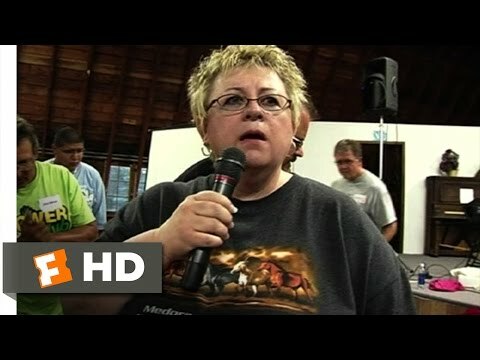 The camp at the center of Jesus Camp, the Kids on Fire School of Ministry in Devil's Lake, North Dakota, was led by a woman named Reverend Becky Fischer. A former camper, Andrew Sommerkamp, years later referred to Fischer as “a terrible f*cking person who is fueled by the spiritual suffering of other people.” Driven by her Pentecostal background, Kids on Fire reflected her fundamentalist views in the form of its "activities." Fischer and her campers focused intently on controversial modes of Christian worship such as speaking in tongues and being slain by the Spirit. Although parents generally knew was happening, the intensity of the camp and its controversial methods prompted many outlets to question whether or not it constituted child abuse. Even still, Sommerkamp says he does not hate Fischer and that what happened at Kids on Fire was not necessarily abuse. "Yes and no,” he told the Guardian in 2016. “I think they had the best of intentions, but I see it as sick people trying to treat sick people." One of the primary purposes of the camp focused on creating an "Army of God" out of its little campers. Early in the film, clips from conservative radio hosts mention the country finds itself in the midst of a "culture war," that traditional Christian, family values are under attack from left-leaning liberals, and conservative Christians must fight back by reshaping the culture back into how it was. Although some Christians believe this means creating a different sub-culture based around things like Christian music and movies (if they even believe in a culture war anymore), Fischer and her camp took this as literally as possible. She dressed her campers in camouflage and face paint, practice war dances while holding wooden swords, and perform stiff-armed salutes. It remains unclear how this would win back American culture, but Fischer was determined to try. Despite its negative connotation, Fischer saw no problem invoking the term "indoctrinate." In fact, even with her new ministry, she frequently refers to what she's doing as indoctrinating the youth. To Fischer indoctrinating children for Christ and "God's Army" is important because, according to her words in the film, Muslims are doing the same thing in the Middle East. Like Holden Caulfield, if there's one thing Fischer hates in the Army of God, it's phonies. At one point in the documentary, Fischer takes the microphone and accuses the children of being hypocritical. She tells them she knows they act differently at school than with their churches, and they must repent of their sin. Fischer wants them to yell their sins out loud in front of God, the other kids, and their parents. Kids everywhere start breaking down and crying as a woman sings some strange melody into a peaking microphone. It's an emotionally heavy scene many would classify as abusive.